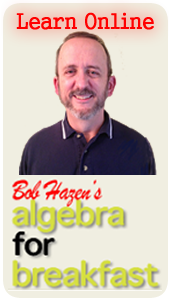 Both SAI and Algebra for Kids, LLC are owned and operated by the husband and wife team of Bob and Sarah Hazen. We began SAI in 1995 after having had several years of success in teaching substantive algebra to early elementary children. • show the unity of K-6 mathematics so as to broaden, connect, deepen, and elevate how kids looked at math in general. SAI does just that! – and we have almost 4,000 students (and their parents) who agree! Sarah is the SAI Registrar. During her time as a home-schooling mom, she was active in the home-school movement for over ten years and served on the board of directors for a regional educational resource center.